With special thanks to Amy Waddell, Wayne Renaud and Aaron Miedema, who made sure I had my facts right. Any remaining errors are my own. The relationship between Society for Creative Anachronism (SCA) and Western Martial Arts (WMA) fighters is an odd one. Both lay claims to being representative of historical swordplay. And yet, despite some cross-over between them, both are divergent systems that are in many ways mutually exclusive. 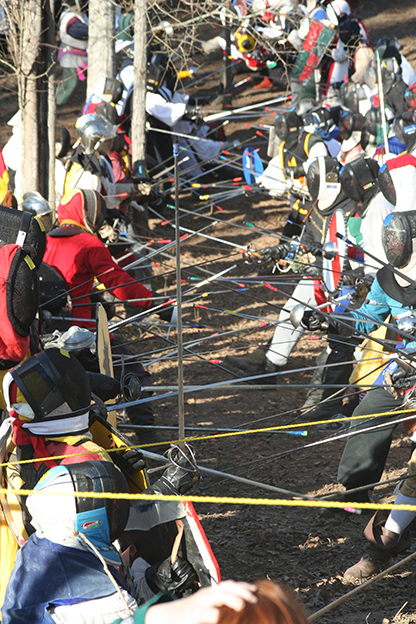 WMA groups use steel practice swords. SCA groups use rattan “swords” – wooden sticks wrapped in duct tape – and consider steel too dangerous for use (with some SCA fighters even suggesting that steel swords would not stand up to SCA-style combat). But why is this? How did it come to pass that SCA and WMA combat diverged to such a degree? The answer to this starts with the very beginning of the Society for Creative Anachronism, and the world from which its combat system emerged. The first SCA event took place in 1966 in Diana Paxton’s back yard. 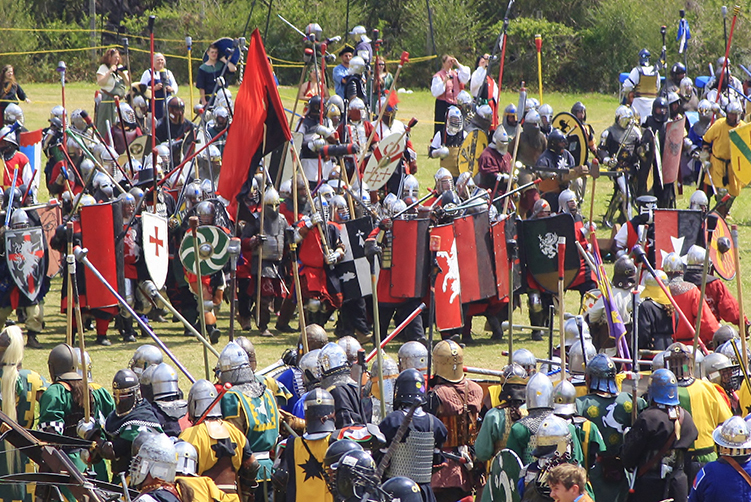 It was a small gathering, centred around a knightly tournament using wooden swords. Alongside that tournament were a few bouts using modern fencing equipment and rules. From this get-together would spring the SCA and its combat system. Two important elements were missing, however, from that first tournament. The first was a body of knowledge of Medieval European sword fighting. While WMA practitioners today have a large library of resources and manuscript translations to learn from, those wishing to learn knightly combat in the 1960s were not nearly as lucky. The Victorian idea that the Medieval sword was little more than a heavy and clumsy sharpened crowbar was only just coming under question, and Ewart Oakeshott’s seminal Archaeology of Weapons had been published a mere six years prior. What was left was enthusiasm and inspiration from literature and the movies. The second – and a partial cause for the first – was equipment. While today it is very easy for a WMA student to purchase a respectable sword for practice and research, the sword market in the 1960s was a very different place. Few bladesmiths specialized in replica Medieval swords, and few of these blades were of sufficient quality for use in a tournament. Those who did, such as Del Tin in Italy – founded only a year earlier – were difficult to locate and were making swords that might be respectable in their day, but did not have the benefit of an active blade-making community or the serious study of swords that would follow. As a result, the proto-SCA fighters of 1966 were left without steel blunts, and had to make do with wooden sticks, many of which Paxton described as “splintering.” As the SCA grew, it not only standardized its equipment to use rattan sticks as stand-ins for swords (and weapons such as axes and polearms), but the SCA fighting style developed to make the best use of those sticks. A very popular and sophisticated fighting style developed. However, it was not sword fighting, nor could it be. The sword market itself still had years before it would reach a point where the equipment was available to make Western Martial Arts possible on a wide scale. And, without the equipment, proper study of the Medieval fighting manuals could not take place. Instead, it was a form of stick fighting that developed in isolation for almost 30 years before the Western Martial Arts reached a critical mass sufficient to challenge it. In a number of ways, the nature of the rattan sticks used by the SCA contributed to some of the divergences from actual swordplay. The soft nature of the wood allowed SCA combat to be considered safe as a full contact sport, which in turn created a scoring system wherein a hit was considered good if it was delivered with sufficient force to be a killing blow, had the blade been made out of steel. This had a paradoxical effect on safety and technique. While the rattan is indeed softer than steel, it also does not flex as steel does, and as a result transfers far more force on a thrust than a steel blunt could. At the same time, on a cut, due to the softer material, the rattan does not transfer force with the same effectiveness as steel, requiring harder blows to register a hit. This, in conjunction with a belief that armor had to be overpowered with forceful blows – as opposed to finding the weak spots and thrusting through them – helped birth a combat philosophy in which heavily armored participants sacrificed reach for the ability to land quick, forceful cutting blows – the harder the better. Engagements that would be conducted at a distance of six feet with steel were often conducted with rattan at four feet or less. The basket hilts used on the rattan sticks for protection also permitted blocking with the hilt in a way that never appeared in Medieval swordsmanship. And, with the shorter engagement distance, the SCA equivalent of longsword – often called greatsword – tended to involve holding the stick vertically in front of the fighter for use as a shield until a blow could be struck, instead of the German and Italian system of guards, blows, winding, and thrusts. While correlation is not causation, it is entirely possible that the rise of the SCA was at least an indirect driving force behind the rise of the modern sword market. With an active population of SCA fighters, there was certainly a greater demand for Medieval replica swords. Del Tin may have been founded a year before the first SCA tournament, but Museum Replicas was founded in 1971, and Windlass Steelcrafts began to sell to the North American market in 1979. Arms and Armor, which would become one of the highest end production swordmakers, was founded in 1982 by a professional jouster. Alongside the increase in production swords came additional research, as bladesmiths and hobbyists such as Peter Johnsson and Angus Trim began to examine Medieval swords with an eye to understanding how they worked, and apply that to the creation of better replicas. By the 1990s, the sword market hit a critical mass – modern replicas began to approach the quality and handling of the swords they were based on. By the early 2000s, high performance swords were on the market that could arguably perform at the same level as their Medieval counterparts. Ironically, during much of this development, production sword companies such as Albion tended to find the very SCA fighters who may have helped make their market possible shying away from the lighter, more historically accurate replicas, preferring instead to buy heavy blades fitting the “sharpened crowbar” image. With the rise of the sword market came the ability to finally begin to decode the large volume of swordsmanship manuals left by the Medieval swordmasters. Techniques previously existing only on paper could now be tested using equipment that handled in a representative way. This began in many places in the SCA rapier communities, where the study and translation of period fencing manuals led to the translation and study of swordsmanship manuals in general. The late 1990s saw an explosion of translated Medieval combat manuals and the foundation of the Historical Armed Combat Association (later known as the Academy of Renaissance Martial Arts, or ARMA), and the early 2000s saw the WMA community reach its own critical mass, with organizations such as the HEMA (Historical European Martial Arts) Alliance containing thousands of members across North America and Europe. One of the early discoveries of the fledgling WMA community developing among the SCA rapier fencers was that SCA heavy combat did not, in fact, reflect what appeared in the Medieval swordplay manuals. This brought the new WMA community into direct conflict with the SCA, with the new WMA fighters realizing that if they were to develop and continue their research, they would have to do it on their own. On the side of the SCA, the reaction to the rise of WMA research often depended a great deal on the individual SCA fighter. While it might be tempting to draw a strict dividing line between SCA rattan combat and WMA swordplay, the situation was far more nuanced. A number of rattan fighters joined the WMA community while remaining active in the SCA, used historical swordplay techniques in heavy combat, and attempted to introduce these techniques to others. Some SCA fighters and fencers began to lobby the organization to find a way to practice Western Martial Arts with steel blunts – or at least heavy rapiers as stand-ins – and in 2005 they convinced the SCA board of directors to allow WMA studies under the aegis of Arts and Sciences, although one of the conditions imposed was that this could not involve competitive play. At the same time, a number of rattan fighters took refuge in defending the SCA stick fighting as legitimate swordplay, creating a backlash as they raised objections, often regarding safety, to the idea of introducing steel combat into the organization. While those SCA fighters who embraced the Western Martial Arts and attempted to incorporate them into rattan fighting could have bridged the gap between the two, the backlash did far more to widen it. The objections to combat with steel blunts raised by SCA rattan fighters were often badly flawed and contradicted by reality – claims that steel swords could not be used safely were easily disproven by the sheer number of re-enactment societies and WMA groups who were doing just that, up to and including full scale battles. When this was combined with an insistence that SCA stick fighting was representative of real swordplay, the organization as a whole appeared outright delusional, particularly to WMA practitioners without sufficient knowledge of the SCA to understand the nuances of the reaction. Regardless of the gulf between WMA and SCA fighting and the efforts made to bridge it, what ultimately exists are two different martial arts. SCA combat is a sophisticated form of stick fighting that developed over 30 years. The Western Martial Arts are a more recent development, a form of sword fighting that is rebuilding the combat arts of the High Middle Ages and early Renaissance by interpreting fighting manuals. Overlap does exist between the two, and will continue to do so. However, they are separate martial arts, albeit with an intertwining history. This entry was posted in HEMA/WMA, Medieval History and tagged hema, practice swords, sca, use of the sword, wma.